A new Japanese trailer for Rampage has arrived online. We're just a couple of months away from Rampage arriving in theaters, which sees Dwayne Johnson not only having a crack at a giant monster movie for the first time in his career, but also tackling another video game adaptation, after having done Doom early on. This time around, we could actually be in for a good video game movie, as evidenced by all of the Kaiju action in this international spot. This new Japanese Rampage trailer doesn't offer a ton of new footage, but it does condense most of the monster action from pervious trailers down into one, jam-packed minute or so that shows just how fun this could possibly be. The best part is Dwayne Johnson, who introduces the trailer to his fans in Japan, speaking some seemingly well-rehearsed Japanese prior to the actual footage kicking in. It's charming, but also shows just how dedicated The Rock is to his career and to his legion of followers all over the world. There's a reason people show up to see his movies. Rampage is a movie that, at this point, you're either sold on or you're not. Seeing the footage presented in this way isn't likely to change your mind about it. Especially if you're someone that's looking for a little more depth beyond a giant monster movie. This explicitly paints Rampage as an all out, city-destroying blockbuster, with The Rock saying some quippy lines here and there. That's either something you're on board for or not. This feels like a movie that could really benefit from some positive buzz once screenings start to happen. Similar to what happened with Jumanji. The 80s arcade game of the same name inspires the Rampage movie, but as anyone who has played the game can tell you, there isn't much story to it. That means the creative team was able to craft whatever story they wanted around the idea of three giant monsters destroying cities across the world. Dwayne Johnson reteams with director Brad Peyton for a third time on Rampage, having previously worked with him on Journey 2: The Mysterious Island and San Andreas. The cast for the movie also includes Joe Manganiello, Malin Akerman, Jack Lacy, Naomie Harris, Jeffrey Dean Morgan and Marley Shelton. Warner Bros. is releasing Rampage in theaters on April 20, which is a somewhat crowded release date. Super Troopers 2 and the Overboard remake are both coming out that day as well, but luckily, they're both going for a pretty different audience. At least Paramount decided to release The Cloverfield Paradox on Netflix. Otherwise, it would have been coming out on this date as well. 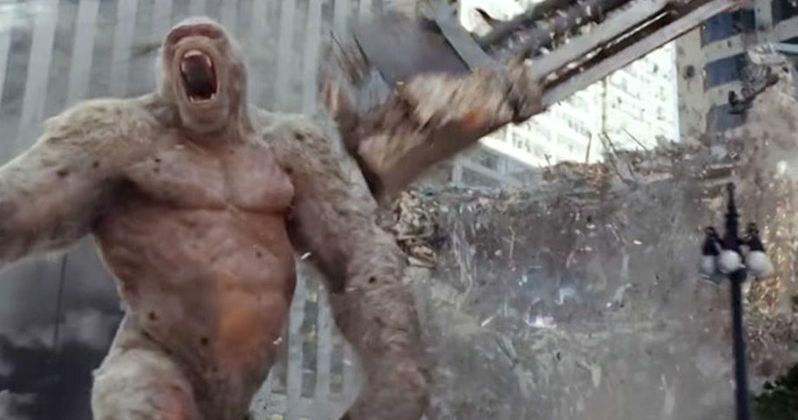 Be sure to check out the new international trailer for Rampage, courtesy of the Comicbook.com YouTube channel, for yourself below.